TMTG follows on from last year’s Rose Bowl Award-winning pantomime Aladdin with this super-cool offering, especially written for the group by our own Lizzie Lindsell. Based on Hans Christian Anderson’s fairy tale of the same name, The Snow Queen is packed with all the traditional fun of the show, with audience participation, hilarious comedy and catchy musical numbers. Plus drama, romance . . . and the occasional tap-dancing penguin. Maybe even a talking snowman or two? So come on in out of the cold for this extravaganza of frozen frolics, taking place on the Armstrong Hall stage in February 2017. It’ll be “ice” to see you. Around February in the town of Björnborg, Frida Longjohns - the Winter Fairy - passes the Season Baton to April Honeyblossom, Sprite of the Spring. Thus, the seasons roll on, as everyone knows. But this year, ice-infatuated Queen Bianca is determined to freeze the change and make sure it stays winter forever! (Cue evil laugh.) With her snowflake subjects to obey her every command, will she succeed? What can young Kristin do to save her fiancé Henrik from the Queen’s icy clutches? Will Dame Gerda ever manage to organise her granddaughter’s wedding? And so the curtain comes down on another TMTG pantomime. Thank you to everybody who came along to support "The Snow Queen" and we hope to see you again soon! Today is your last chance to see our 2017 pantomime "The Snow Queen", so come on down to the Armstrong Hall this afternoon and evening and 'chill out' with TMTG for our final two performances! Just a few tickets left for this afternoon's performance of "The Snow Queen" (2:30pm), and we also have availability for tonight (7:30pm). It would be 'ice' to see you! Don't forget about our special "The Snow Queen" snapchat filter, available throughout the week of the show at the Armstong Hall! Just take your photo on the Snapchat app and swipe across to find it (make sure you have location services turned on). Queen B is officially in the ice house (well, the Armstong Hall)! Thank you to everybody who joined us for our opening night of "The Snow Queen", we've had some fantastic feedback and we can't wait for our next performance tonight. Still tickets left if you would like to join us! Snapchat lovers! If you're watching "The Snow Queen" this week make sure you use our special Snow Queen filter! Available from Wednesday to Saturday night at the Armstrong Hall. To use it make sure you have your location settings turned on, take the picture and swipe across to find the filter. Make sure send to your friends and save and share your pictures with us! We can't believe that the week of our show has arrived! Ticket sales are really picking up now so now's the time to buy if you haven't already (we wouldn't want you to be disappointed!). Looking forward to seeing everybody over the week and thank you all for your support so far. It's snowing (albeit only slightly) and it's the final weekend before "The Snow Queen" opens at the Armstrong Hall. Coincidence? WE THINK NOT! "The Snow Queen" has moved into the Armstrong Hall! Our upcoming pantomime "The Snow Queen" includes 6 members of TMTG Juniors who are doing a fabulous job in rehearsals so far. Here there are in full flow, and you'll be able to see them onstage at the Armstong Hall in just TWO WEEKS time! We're back down at our scenery store this morning building and painting scenery for "The Snow Queen". Just a few weeks to go now! Well we suppose it won't be giving TOO much away to share this time-lapse video of our rehearsal for "The Snow Queen" at the Armstrong Hall last night. You'll have to buy a ticket if you want to see the slowed down version though.. Rehearsing at the Armstrong Hall for "The Snow Queen" tonight, must mean that the show is getting close! It's really quite chilly building and painting scenery this morning, but perhaps we should just call it method acting for "The Snow Queen"? Arts organisations in Bristol and Bath are having a 'Bristol & Bath Jan Arts Flash Sale' tomorrow, so we thought we would join in with a little sale of our own! 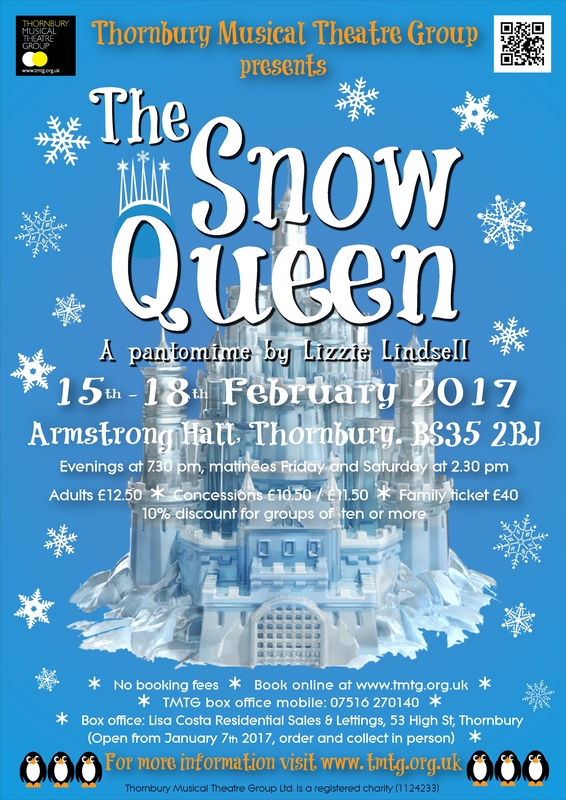 Come and see something different this February half term with our production of "The Snow Queen", at the Armstrong Hall from 15th-18th Feb (inc. Friday & Saturday afternoons). We're certainly not following the panto crowd this year! Just ONE MONTH to go until opening night, so here's a preview of our pantomime "The Snow Queen" with some pictures from today's photoshoot! Our box office for "The Snow Queen" opens tomorrow (7th Jan) at Lisa Costa Residential Sales & Lettings, 53 High Street Thornbury, so we must be getting close! Who heard Lizzie Lindsell, TMTG member and writer & director of our upcoming pantomime "The Snow Queen" on BBC Radio Bristol this morning? She chatted about why she loves pantomime as well as our show in February...do go and have a listen! Inspired by one of our recent performances? Or looking for a new hobby? TMTG needs you! After a successful casting for our upcoming pantomime "The Snow Queen" (15th-18th Feb) we are still looking for MEN to join our chorus. If you are interested, or know anyone who is, please get in touch via membership@tmtg.co.uk, we'd be delighted hear from you. Read more about TMTG needs you! I wanted to tell you how much we'd enjoyed the panto last week. Well done you for all the blood, sweat, tears and toil to make it a reality. Hurrah to the cast and crew. Wonderful performance this afternoon, thoroughly enjoyed by us all. Wow, what an amazing show. The Snow Queen is an extremely happy, vibrant show, done with aplomb. Loved it! Go and see it, you will be glad you made the effort! Well done everyone! We went on Wednesday night - it was absolutely brilliant- I came home with a sore throat from shouting "he's behind you" " the sun has got his hat on" and booing!!! BRILLIANT!! We went to see the show last night. It was a great show so good not to know the plot! Congratuations to Lizzie on wirting and directing it. Another brilliant show! Well done all involved. I'm feeling hot hot hot! Very entertaining and lots of laughs! It was a brilliant spectacle and thoroughly entertaining with a great balance of comedy, drama, music and dance. Particular highlights were the Winter is Coming scene, Queen Bianca's MCing and the dame's lingonberries. A concerted effort from all involved. Enjoy the rest of your run. Good fun evening came out smiling. Loved the penguins. What a brilliant evening watching TMTG perform the Snow Queen written and directed by the talented Lizzie Lindsell. Barbara Smith as a fairy!!! I enjoyed upstaging Dave Walker even though I wasn't on the stage! David Wrench continues with being the dame with his own style! Congratulations to Natalie Britton especially for her singing. And Alison Maria Hennessey your blue lips and carrot nose were a sight to behold. Enjoy the rest of your week. Acting, Singing brilliantl. Just very well done. Looking forward to the next production. Awesome show, loved it. Don't want to give to much away but the fiddle playing penguin did it for me.